New find / acquisition. Usp compact. Thread: New find / acquisition. Usp compact. I was stunned to find this guy hanging at my lgs. $500 and it appears to never have been shot, came with a spare mag and original box. Date code puts it at '97 manufacture which means new style firing pin, etc. I'll be looking to put Dawson's in it, match trigger kit and pickup a bladetech iwb holster. Having recently having bought a benelli, I wasn't looking to buy anything soon but couldn't resist when I saw this. Usp's have long been my favorite. bp1, Fort Tom and glock19er like this. You surround yourself with people who make you laugh. Forget the bad, and focus on the good. Love the people who treat you right, pray for the ones who don't. Life is too short to be anything but happy. Falling down is a part of life, getting back up is living." Congrats and I officially hope you stubb a few toes tonight. I have been bidding on USPc SS 9mms on GB for ages and can't get one for less than $925+ Not sure why they have been bid up so high lately...sigh. Really nice score! Save the whales. Redeem them for valuable prizes. Good for you. I've only recently acquired my first USPc in .40 S&W, and have been scouring the area for one in 9mm since I liked it so much. It appears that folks who have them around here want to hang on to them. Maybe I'll get lucky like you. Last edited by Fort Tom; 04-13-2019 at 10:48 PM. Keep your eyes peeled. One thing I've learned is that you never know what you'll see pop up and you never know what price you might find it for. I'm hoping to snag a p30l and compact in 45 soon too. 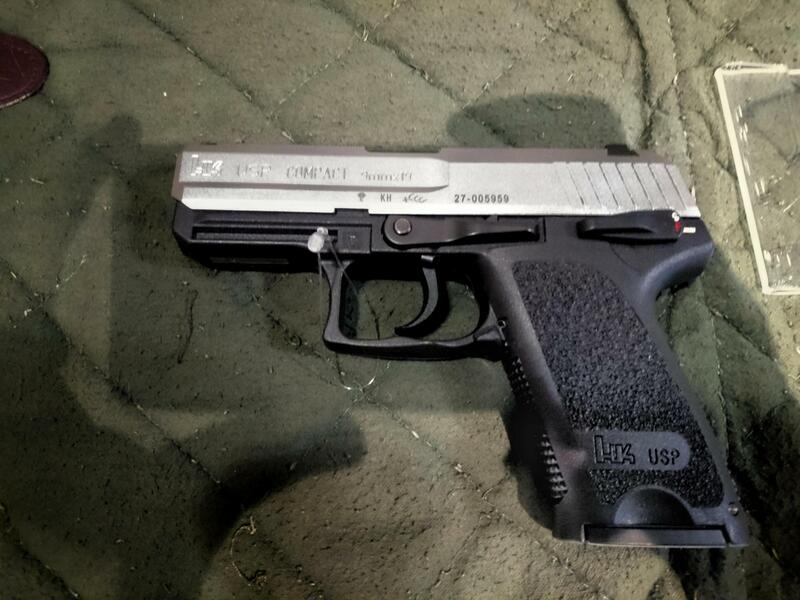 This joins my usp tactical 45 which is my favorite handgun to shoot. Hopefully I enjoy it as much. We'll see when I take it out next weekend. 2005 is when HK changed over to the new-style Firing Pin/Firing Pin Block/Spring; definitely not '97.